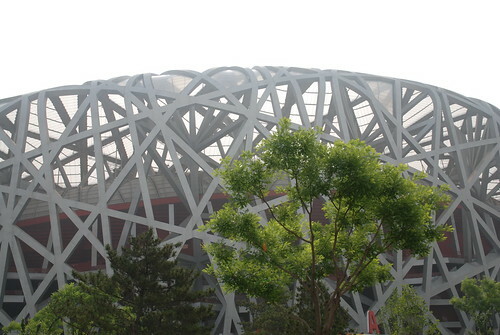 This is part of the Bird’s Nest where the athletics took place during the Olympics in 2008. The stadium is very big and it took us quite some time to walk around it on the outside. The architecture of it is fantastic! 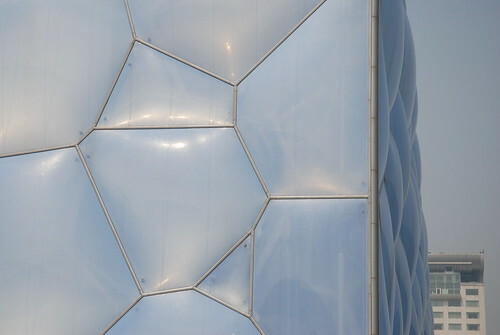 The Olympic swimming and diving took place here in the Water Cube. They are now revamping the inside of the arena to become a public water park and there were high fences up so we couldn’t see all of the building. The bubbly surface is made out of millions tinytinytiny parts and you can tell when seeing it “up close”. 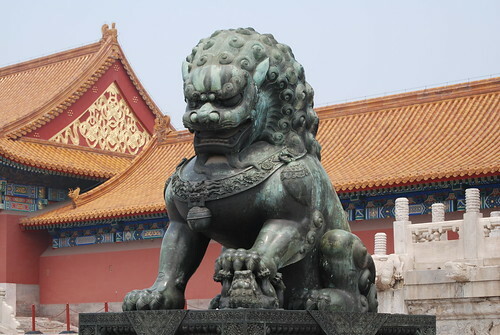 This Chinese lion stands guard in the Forbidden City. This is the female lion, it’s standing to the left of the entrance of one of the temples and it has a lion cub under its left front paw. 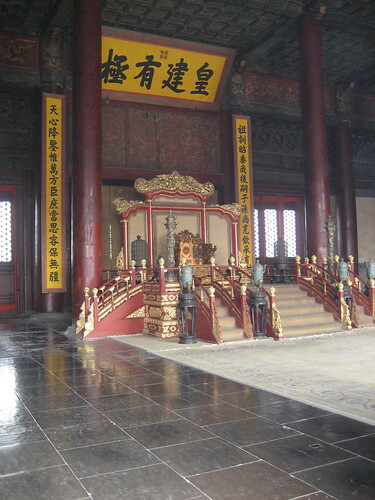 Behind it you see one of the temples in the Forbidden City. The yellow is considered to be the emperor’s colour and all roofs in the city have this colour. 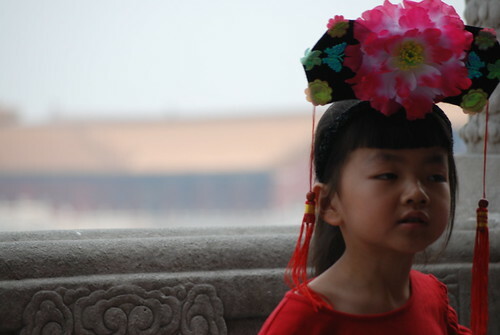 This girl was visiting the Forbidden City with her parents. 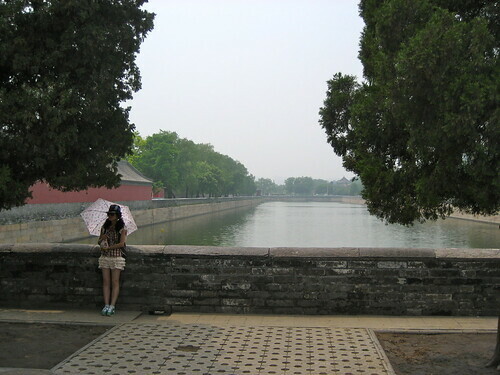 The moat goes around the Forbidden City and is quite wide. I really liked the way the girl unintentionally posed with her umbrella while waiting for some friends. Just north of the Forbidden City is a park with a hill in it (if I remember correctly it’s made of the soil from when the moat was dug) and on top of the hill is a small temple with a Buddha inside. Outside the temple this girl was posing for her friends’ to take pictures and I couldn’t help myself. 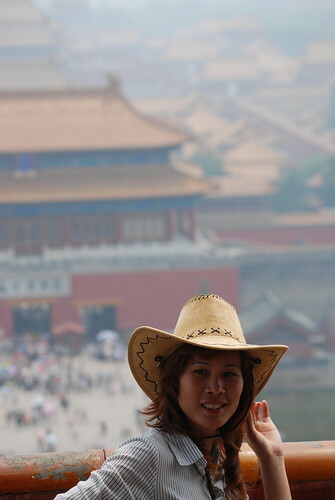 Forbidden City in the background. 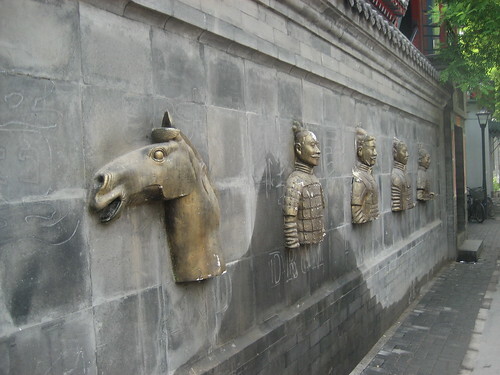 The third part of this series will contain pictures from my visit on the Spirit Way and the Ming Tombs Area. Anna, your pictures are *breathtaking. * You have such an eye for photography–I feel like I’m there! I love that you’ve captured little details of things on the streets, not just the attractions. So fantastic. Thanks for sharing! I love that you caught photos of other people posing – what a great way to get great shots! How neat that you got to experience some of the buildings where the Olympics were!